It’s gorgeous and it’s delicious. 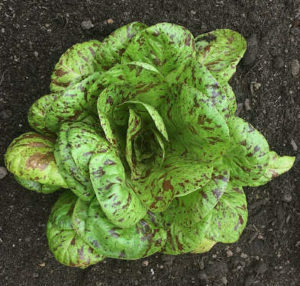 ‘Freckles’ romaine lettuce. I saw the following question on Quora: “I am an absolute beginner in gardening — where do I start?” Becoming a gardening expert might not be in the cards for everyone, but knowing your way around a garden can relieve stress and keep you connected to nature. But how? Just do it! Everyone knows the very basics of how to garden: plant a seed, bulb or a plant in some dirt and take care of it. It’s the details that can trip us up. With all the variables (sun, water, air movement) in any growing environment, I think the best thing is to pick a project, get started and do research a little bit at a time along the way. There will be Googling and that’s ok.
One important note on all projects: Get good dirt. If the dirt where you live isn’t good for growing the flower or vegetable you choose, it’s gonna be a tough road. Start out with a potting mix in a flower pot or container, one that includes drainage holes. Later on, you can learn about how to make the dirt outside in your garden beds better for growing in. Here are some projects that I think are really good for beginners, along with some details on each. Direct sow, if you want to start seeds. To direct sow is to put seeds right in the soil you plan to grow them in, instead of starting them in small pots indoors and then moving them to bigger pots outside. 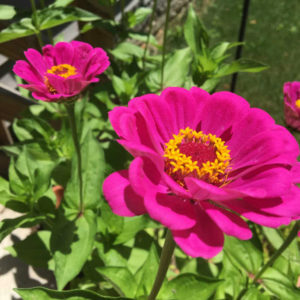 Zinnia ‘Purple Prince’ is very easy to grow. Some of the seeds that work best as direct sow are sunflowers, zinnia and lettuce. You don’t have to start them indoors and therefore you don’t have to worry about them getting enough light. Follow the instructions on the seed packet and put your container in the sunniest outside spot you have. Even if you don’t water them every day, check on them every day. When should you plant them? For the sunflower and zinnia, wait until your last frost date has passed. What’s that? Basically, when the coast is clear for cold that could kill your tender plants. Here’s a handy map of last (and first) frost dates from Bonnie Plants. For the lettuce, plant those seeds three weeks before your last frost date. If you don’t want to start with seeds, you can also look for zinnia, sunflower and lettuce plants at your local garden center. I live in Ohio, which is pretty much known for being overcast, but I’ve had a lot of success with jade and ZZ plants (Zamioculcas zamiifolia). I don’t have either in direct sun, but they’re doing well and they look great. I’ve been watering the ZZ plant every week and the jade every other week. Other good houseplants to try are sanseveria, schefflera, pothos, philodendron and rubber tree. The hip new garden product out there is the countertop garden. These modules offer varying degrees of automating care for your garden. Most help with keeping plants watered and many include lighting and hydroponic (no soil, just water) growing. Best case scenario: They take almost all the burden off the gardener to remember to care for the plants. Can you beat that? These gardens also have a secret mission: while it seems that you set them and forget them, they can also teach a beginner gardener the needs of a plant’s lifecycle. By watching a smart garden operate, you learn how often they need to be fed, how much light they need and how much time to produce a fruit or flower. Once you see this cycle, trying to grow a plant on your own with less technological help seems not so scary. A few examples, the Smart Garden from Click and Grow, the AeroGarden from MiracleGro, Modern Sprout and KRYDDA/VÄXER from IKEA. What was your first garden project? Was it a success? Do you recommend a project to beginner gardeners? Let me know in the comments on Twitter @howtonaturechat.